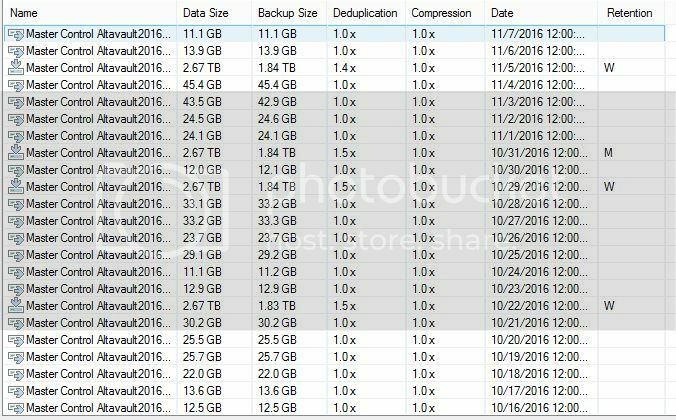 Backup copy monthly not always end of the month? My main backup jobs have a 5-7 day retention, forward incremental with synthetic fulls spaced out once a week through he week. I have backup copy jobs running that are set to 14 restore points, 4 weekly's and 84 monthlies. I have the option to " read the entire restore point from source backup" checked because we are pushing these to a NetApp AltaVault and don't want to create synthetic fulls on the device. What I am seeing is that the " monthly backup on the last day of the month" isn't falling on the last day of the month. I've had this running for a few months and in one example, on 8/30 a monthly was created. Then my next monthly is dated 10/14? One of my copy jobs ran all of September but failed on the last day of the month. It continued on the 1st of oct but the first monthly was on 10/7? Its like it deleted all the points from Sept.
Is it possibly because my main restore points are only set to 5 so it can't find a good full at month end to copy? Trying to figure out how to get my timing right so I get a month end every month. Re: Backup copy monthly not always end of the month? If using "read the entire restore point from source backup" option, note that active full backup method does not always copy the most recent restore point from the source backup repository. If the necessary recent restore point has not been created by the time the GFS task must start, Veeam Backup & Replication will copy the latest available restore point from the source backup repository. So it should not be related to the length of the source jobs` chains. I've had this running for a few months and in one example, on 8/30 a monthly was created. Then my next monthly is dated 10/14? One of my copy jobs ran all of September but failed on the last day of the month. It continued on the 1st of oct but the first monthly was on 10/7? Its like it deleted all the points from Sept.
What was the duration of those monthly runs? If data transfer does not fit the synchronization interval, the synchronization interval is extended with the mentioned option. By duration do you mean when when was the last full created on the source backup job? I'm not 100% sure what you are asking. I wondered when the synchronization and data transfer process started and when it finished for the job. By the way, have you checked which source backups(restore points dates) has been copied by the backup copy job? I ended up opening a support ticket just so they could verify what I am seeing. The job in question is a really big job, the synthetic full takes over a day, then the backup copy job takes another day beyond that. So to answer your question, yes, there are a few days in between synchronization schedules. What we've seen so far going through the job is that Veeam is not tagging any of the restore points for the job in question as a monthly point, only weekly's. For Example, if a full is taken on say Friday the 28th of Oct and tagged as a weekly, then incremental through the next Friday the 4th of Nov when another full is taken and copied, that is also tagged as a weekly. One of those should have been tagged as a monthly but are not for some reason. So what ends up happening is once the weekly retention of 4 are hit it will start deleting the weekly's including the 28th and 4th leaving me with no monthly point. If you configure weekly and monthly restore points to be created on the same day(e.g. weekly on Sundays and monthlies on the last Sunday of the month), only one restore point will be created and marked as "Monthly" and "Weekly". It will be deleted accordingly to the latest retention of both, so no need to worry about that. Please post your support case number for us to follow the issue. Thanks for the info, the case number is 01967519. Do you know if it will show that it is tagged as both the monthly and weekly in the console. This is what I am seeing. It will be marked as both Weekly and Monthly if they set up to run in the same day, like Saturday in your case. Looks like in the second job you`ve set Monthly to "Last Monday" and Weekly to "Every Saturday", that`s why you have more .vbk files. That's correct, they both have the same settings. Weekly every Saturday and monthly last day of the month. The first job is just missing its monthly . From what I have read, even if the backup copy doesn't run on the last day of the month, it should tag the next full as the monthly. Because of how many jobs I have, this job sometimes has to wait a few days after the end of the month to copy. If Veeam tagged the 29th or 5th full job as the monthly that would work for me, but it's not happening. Backup copy job uses forever forward backup method by default, so the full backups themselves are created not in the mentioned day, it just remains and being marked as weekly/monthly/etc. Anyways you are missing one full backup. Please keep investigating with the support team.